Madhya Pradesh is situated in the central part of India,its well known for its hospitality towards all the touritsts who visit this magnificent land. Their cuisine changes depending upon the people and the regions they belongs, so this cuisine varies regionally.Madhya Pradesh is a foodie's paradise when its comes to traditionl cuisine and richness in all the delicacies that can suit prefectly your tastebuds.Wheat and meat are common in North and west of this state while rice and fish is common in South and east.Places such as Bhopal has a strong Muslim influence and you can enjoy rich food prepared with rice, spices and famous for its kebabs,biryani,korma,keema etc.Indore and Gwalior are well known for its many milk based food products.Dal bafla is a common meal and its prepared with wheat flour, which is a wheat cake cooked by steaming, grilling and dunked in ghee which is eaten with daal and laddoos. A famous breakfast of Indore region of central Madha Pradesh is poha (rice flakes cooked with spices)usually eaten with jalebi.Few famous Madhya Pradesh dishes are Bhutte ki Khees,Chakki ki Shaak, mawa bati, Khoprapak, Shrikhand, Malpua. Obviously Madhya Pradesh cuisine had a special place among the cuisines of India, the biryani of Madhya pradesh is also worth mentioning here. While am chosing a dish from this cuisine, initially i want to make their famous butte ki khees but while going through this site i got hooked to this interesting crunchy munchy Khurma, dont mistook with the khurma,a sweet kheer we make usually with thin vermicellis.This khurma is a deep fried snacks which is then coated with a sugar syrup. This kurma is as much as like the famous Shakkara para, a sweet biscuits which is quite addictive. 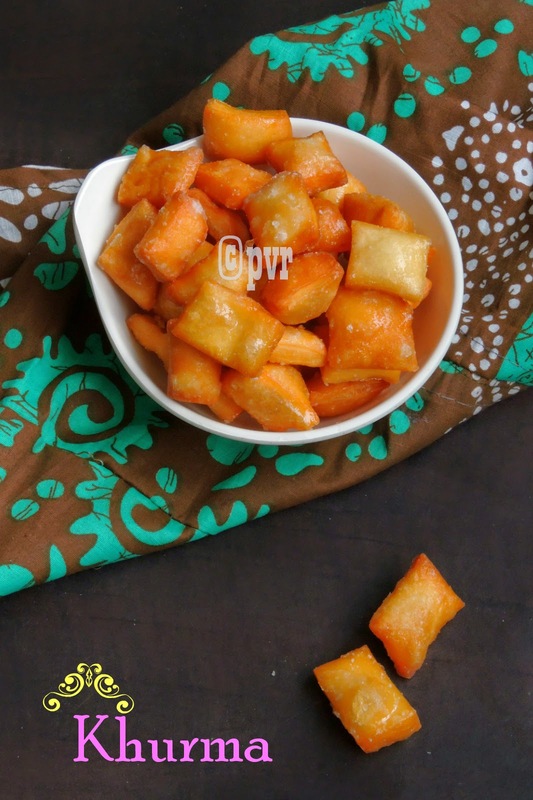 Definitely an easy breezy evening snacks you can enjoy with a cup of masala chaai. Mix the flours well in a bowl, add the warm ghee, salt. Add the ghee,mix well with your fingers. Add the water gradually and make a stiff dough,keep aside for half an hour. Divide the dough into two balls, roll a ball into a medium thick disc. Cut it as squares and deep fry until golden. Meanwhile boil the sugar ad water as two string sugar consistency. Drop the fried khurma into the sugar syrup. Drain quickly and let keep aside for few minutes. Store in an air tightened box. Khurma, I thought it is going to be a gravy side dish... this is so tempting!! crunchy munchy!! Almost same like our Maida biscuits. This must be yummier as its soaked in sugar syrup.Love this! This sweet similar to Sweet version of Diamond cuts. But with the addition of ghee, it must be tastier, melts in mouth than the diamondcuts. 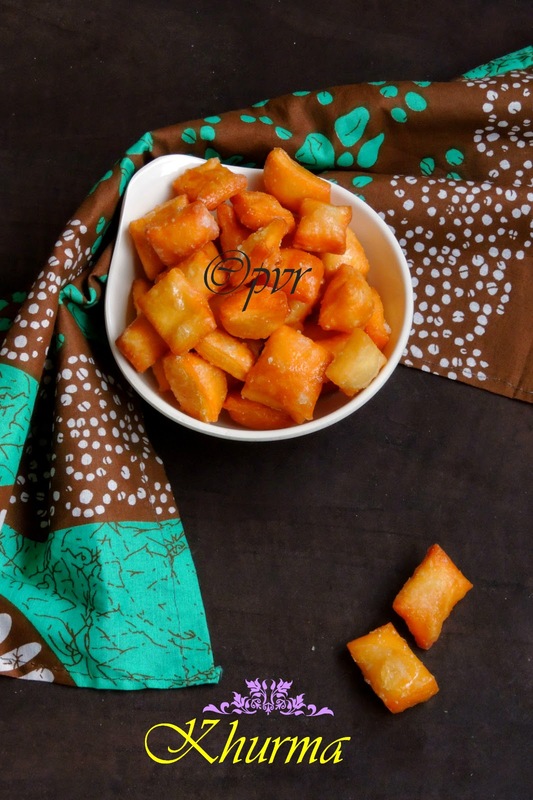 lovely crunchy bites, seems to be another name for shakkar para. Well written post Priya, looks very tempting too. I have never had these ; love the color of the dish. Super crispy and tasty snack!! Crispy, crunchy, and delicious snack! I would add some spices to it for myself! Even I thought it'll be a gravy, but a snack, looks delicious..
Looks yum,children would love to have this Priya. I just want to pop them into my mouth thru my monitor. We make this in Maharashtra too. Yummy! Love this dish. Nice choice. These diamond cuts look so inviting Priya. When I saw the name in the link up, I thought it as a gravy!!!! After seeing the post title Khurma ,I thought its going to be a gravy with onion and tomatoes...such a simple yet delicious,munching crunchy snack..will make it for sure.. I didn't know about a khurma that you say is a a sweet kheer we make usually with thin vermicelli!..and I thought you were talking about Kurma..very nice dish Priya...looks very addictive for sure.. Deceiving name but addictive for sure. Shakkar pare with a different name! The Indians who came to the Caribbean came from all over and this is one of those. This is actually very popular snack in Caribbean and especially in Trinidad, Guyana and Suriname. I get this from Caribbean bakeries here in NY and is one of my fave snacks. Sweet delicious and addictive snack. I came here thinking this was the gravy kurma! And this is a super addictive snack na! omg khurma kolludhe!!! very very tempting and addictive sugar coated munchies :) I wud love to grab some right away ! !